Artistry In Plants' team believe that plants are live art, and each garden or landscaping project should be carefully crafted to reflect the individual homeowner's lifestyle, architecture and passions. We have been providing artIstic residential landscape design, installation, and maintenance and commercial or residential container gardens since 1996. Furthermore, we are licensed to provide interior landscape designs. We use only organically grown flora and plant products, specializing in land and water preservation and plants of architectural interest. Our customer service is a strong value of ours-- we truly treasure our relationships with each client we work with. We strive to be attentive to and respectful of your personal property and specific requests, and we are always friendly and professional. Give us a call today, and we will happily work with you to create a garden you will love. Landscape Design Build company specializing in low maintenance gardens with an emphasis on sustainable practices such as native plants, rain gardens, reduced lawn areas, and planting for pollinators and wildlife. At Garden Environments, our gardens are artistry in motion and we create places that allow you to feel free; free to dream, free to breathe and free to just be. By using and incorporating native plants life, your garden space will be alive, thriving and running free, just like your mind and spirit will be when you spend time there. If you are ready to discover a world where the only boundaries are how far your imagination can take you and you need a space that reflects and complements the natural architectural features of your home, than you are ready for Garden Environments. Call us immediately for a free consultation and to experience a space where nature embraces you. Garden Environments would welcome the opportunity to create a space of peace and tranquility for you. For the past 12 years, I have had the pleasure of designing and installing beautiful landscapes within the Triangle area - large or small, residential or commercial, annuals, perennials, edibles - we can do it all! This is not a job to me, but a lifestyle and a true passion. I am blessed to be able to bring that passion to you, the customer. Working hand in hand with you about your landscape desires, I'll handcraft - on paper or on computer - a unique design, unlike anyone else. I can work within your budget to turn your outside dreams into reality. Please review my work and contact me for a one-on-one appointment. I cant wait to show you just how beautiful your landscape can be! Landscape designer and full installation company. The Lehmann Design Group is a small Triangle based landscape architectural and project management firm owned by Michael R. Lehmann. He is a registered landscape architect in the State of North Carolina (#1683). Mike is a graduate of Michigan State University (1975) with a bachelor of landscape architecture degree (BLA), and has been practicing his craft every since. Craft beers, artisanal bread, farmer’s markets, personal trainers, specialty stores of all kinds, that one of a kind local restaurant… many of us seek out the special, the personal touch when we can. Your landscape needs are equally unique. I am Mike Lehmann, landscape architect and owner of the Lehmann Design Group. I have been producing artisanal, hand drawn custom residential landscape masterplans tailored to the unique and special needs of my clients for 40 years. I can do the same for you. As a design professional, I work specifically for you — your home, your needs, wants and desires, your family, your budget. My job is to put it all together so it all works, before you call the contractors, the nursery people and the suppliers. 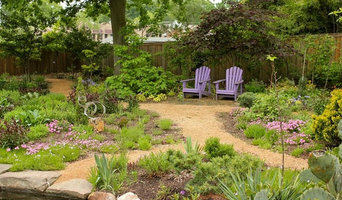 Ritter Garden Design is a small boutique design/install company that really focuses on the clients needs. We offer design services and installation services. We only install one project at a time so you receive our full undivided attention throughout the project. Our past designs include swimming pools, driveways, production gardens, outdoor kitchens, fire pits, patios, formal gardens, foundation plantings, lighting, permaculture design, water features, sheds, pergolas, sitting walls, retaining walls, areas for livestock, etc. On the installation side we primarily install hard scape (patios, fire pits, seating walls, & lighting) as that is what the bulk of our clientele desires. We have 27 years of experience in the business as well as a BS in Horticulture/Landscape Design from North Carolina State University. Lotus Designs has been creating inviting outdoor spaces in the Sandhills/Moore County area for over 30 years. Under designer Gail Scott, Lotus Designs provides personal, experienced, landscape design services and installation, to both residential and commercial property owners. Once a plan is developed the work is then estimated and set up for installation. We work on new and existing homes and businesses and deliver professional computer drawn plans on time and in keeping with any ARB requirements that might be needed. Commercial work includes schools, churches, local retirement communities, and local businesses. We specialize in inviting backyard landscapes that often include patios with fire pits, outdoor kitchens, new or redesigned decks, screen porches, pergolas, pools and pool houses. 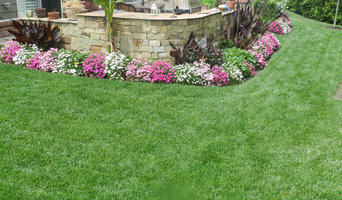 On the first meeting we discuss everything you want out of your landscape. We also discuss your preferences on style, functional use, and plant materials. Once we decide on the scope of the project, we can give you a firm quote and timeline. After the Landscape Plan is designed, we meet again to review the overall plan layout and all materials. Once a bid is accepted, the work is put on a schedule. Gail works closely with the installation team and the clients to ensure the highest quality in workmanship and customer satisfaction. Note: On-site consultations can also be made in lieu of a plan if desired. Tim Knowles is landscape architect located in Greensboro, North Carolina. He has over 30 years of experience, 20 years of which came from a design/build background primarily working on high-end residential projects. He currently does preliminary site planning, renderings and consulting on commercial projects and limited designs for new and existing residential clients. Tim is also a commercial real estate broker specializing in land and multi-family investment properties. 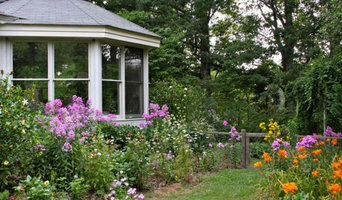 An artist and garden designer with over 40 years experience . Sears Design Group, P.A., Research Triangle based firm with offices in downtown Raleigh, was founded in June of 1979 by Dan C.L. Sears. The mission of Sears Design Group then and now is to create high quality, user-driven public and private spaces. Our goals for these projects is to reflect the environment in which they are found, be low maintenance and cost effective. The size of the firm is maintained at a level where our principals participate in all the firm's projects. These goals guide our design decisions and services proposals. 40 years experience designing and installing creative landscapes. Renz Landscapes is a custom landscape design and contracting business with offices in Cary, NC. The business was founded in 1978 by Curt Renz, Bachelor of Environmental Design in Landscape Architecture NCSU 1975. Our projects typically are residential and range from $3000 to $40,000. Our goal is to bring you quality, cost effective, homeowner focused design, and solid workmanship. The mark of a well designed, installed and maintained landscape is just as attractive ten years from now, as the day it was completed. The work of this outdoor professional includes most everything surrounding a home's exterior. A landscaping architect can even work with the home architect to choose the right spot for your Durham, NC house. From there the Durham landscaper will develop preliminary concepts for your front or backyard design based on individual needs including the climate and activities that will take place, as well as layouts and planting plans. Landscape architects will also design any structures or outbuildings that will be added to the space. Any grading changes that will be added to the yard are also the responsibility of the architect. This includes any drainage modifications. An engineer can also be responsible for these tasks, but licensed North Carolina landscapers are fully capable. Like building architects, they will produce preliminary concept drawings as well as detailed construction documents and planting plans. Three-dimensional renderings and illustrative plans are all supplementary. A Durham landscaping designer generally will have ecological, aesthetic and technical training, which helps them maximize the potential of your outdoor space. Keeping in mind both style and functionality, garden designers analyze your architecture and yard to produce a plan that may or may not include location and materials for walkways, patios, water features, fences, garden aspects and more. 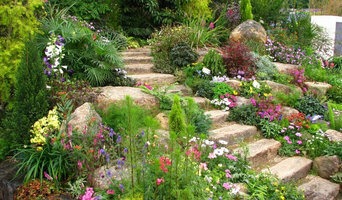 In addition, a landscaper in Durham, NC will carefully assess your geographic region to choose plants, trees and flowers that will flourish naturally, as well as address concerns such as drainage, screening and soil conditions. Certain landscape designers only help with the planning portion, while some may deliver the plans and then oversee a hired landscaping contractor. Others — typically following a design-build approach — take care of both the design and all aspects of the landscape architecture and construction. Find a Durham landscape architect on Houzz. 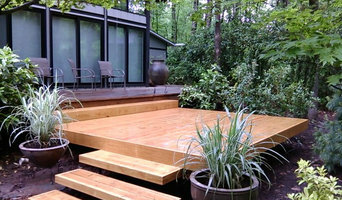 Narrow your search in the Professionals section of the website to Durham, NC landscape architects and designers. You can also look through Durham, NC photos to find a space you like, then contact the professional who posted the photo.